Inspired Color. Defined Performance. : Weathering: Which tests are right for which applications? Weathering: Which tests are right for which applications? So with unpredictable weather conditions in so much of the world, it’s no surprise that a wide variety of weathering tests are necessary to predict plastics products’ performance. Americhem conducts weathering tests in real-world, outdoor settings (including Ohio, Florida and Arizona) as well as in a wide variety of accelerated weathering devices, which are either powered by fluorescent or xenon arc technology. We have learned over decades of experience that certain tests are right for certain applications. 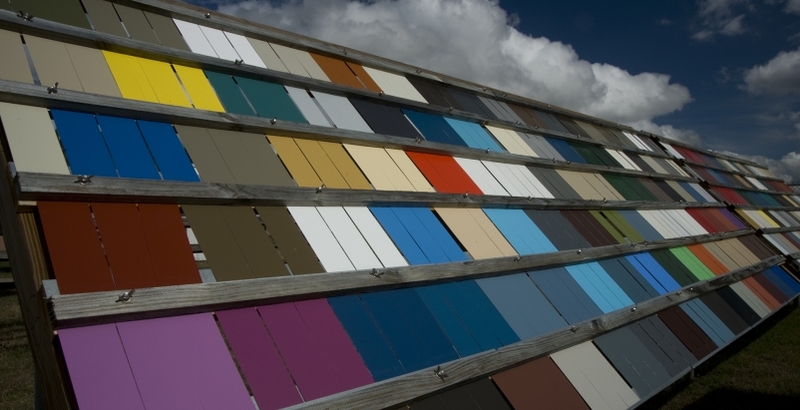 For plastic building products, a variety of tests are required depending on polymer, setting and purpose. QUV fluorescent devices were initially used to test painted steel for the coatings industry. As it turned out, it was discovered through trial and error that these same devices also worked well for vinyl siding. We have found that vinyl, or PVC, is best tested in QUV devices, but other building products plastics, such as ASA and acrylic, reveal their failure mechanisms better in xenon arc devices. Certain polymer blends don’t respond well to accelerated testing at all, thus necessitating real world, outdoor testing. You can read more about this phenomenon in our recent white paper. 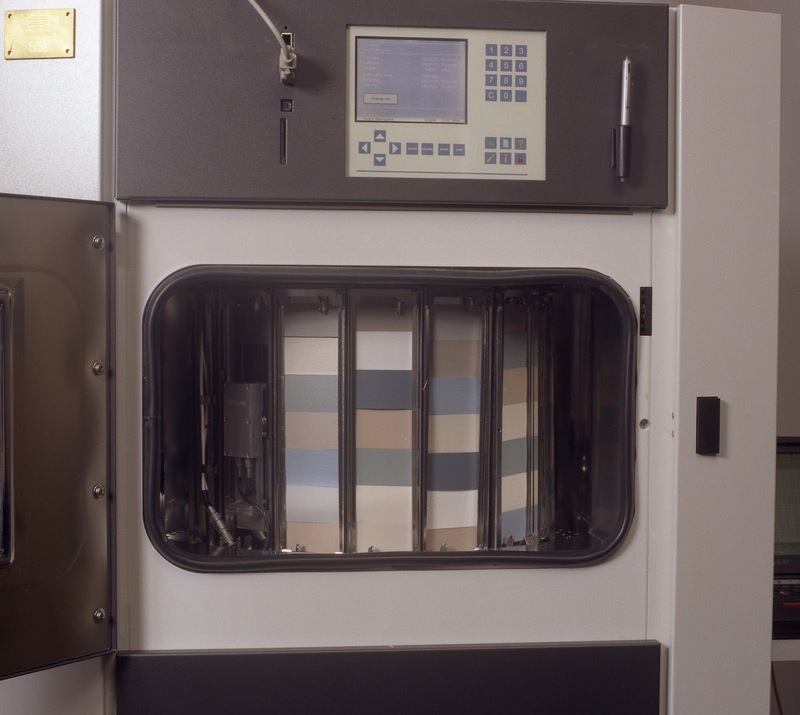 In general, when choosing accelerated weathering that requires the full range of the light spectrum, including UVA, UVB, UVC, IR, and others outside the visible spectrum, xenon arc testing is the correct choice. In the automotive industry, each OEM specifies their own accelerated weathering testing protocol for interior and exterior parts. These are usually based on one of two industry standards created by the Society of Automotive Enigineers (SAE) – SAEJ1960 or SAEJ2527. The industry relies heavily on accelerated testing because of the extended time required for outdoor testing. In the synthetic fibers industry, the American Association of Textile Chemists and Colorists (AATCC) specifies a test called AATCC16, which is for interior curtains, carpets and similar textiles. This test is run on xenon arc equipment. For outdoor fabrics like boat covers, awnings and tents, ISO 4892-2 is used, which is a general purpose accelerated test using xenon arc devices. This allows for the full range of exposure to UV and IR light, as well as moisture spray which simulates outdoor conditions. This is in contrast to QUV weathering, which can simulate condensation, while xenon arc devices cannot. The synthetic turf industry also uses ISO4892-2, which is used as a screening test (as are all other accelerated tests) to determine when products will fail to hold color. Americhem has done extensive weathering studies on colors used in synthetic turf and is considered one of the world’s leading authorities on the subject. So as you can see, plastic products run the gamut as to which weathering test is most appropriate. We’ll continue to utilize and create best practices for accelerated and outdoor weathering, working closely with the people and organizations who establish the standards.